This week I ran a workshop on mind mapping, brainstorming, and timeline creation. These are the timeline creation tools that I included in the workshop. Meograph offers a nice way to create narrated map-based and timeline-based stories. Much of what Meograph offers can be accomplished in Google Earth. However, Meograph is browser-based so that students can create stories even if they cannot install Google Earth on their computers. Dipity is a great timeline creation tool that allows users to incorporate text, images, and videos into each entry on their timeline. Like most good web tools, Dipity has a collaboration option and has multiple options for sharing your timelines publicly or privately. Each entry to a Dipity timeline can include multiple types of media which allows users to add more detail and information than can be included in a traditional timeline. If you want to import Tweets and other social media messages, you can do that too on Dipity. Dipity will work on your iPad. myHistro is a timeline builder and map creation tool rolled into one nice package. On myHistro you can build a personal timeline or build a timeline about a theme or event in history. Each event that you place on your timeline can be geolocated using Google Maps. myHistro timelines can be created online or you can use the free iPad app to create events on your timeline. I like XTimeline because I find it to be a great service that is very accessible to high school students. 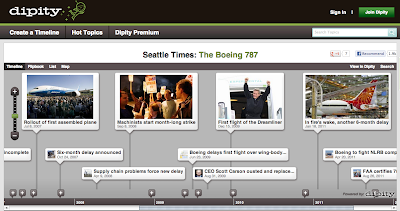 Using XTimeline students can collaborate, just as they would when making a wiki, to build a multimedia timeline. 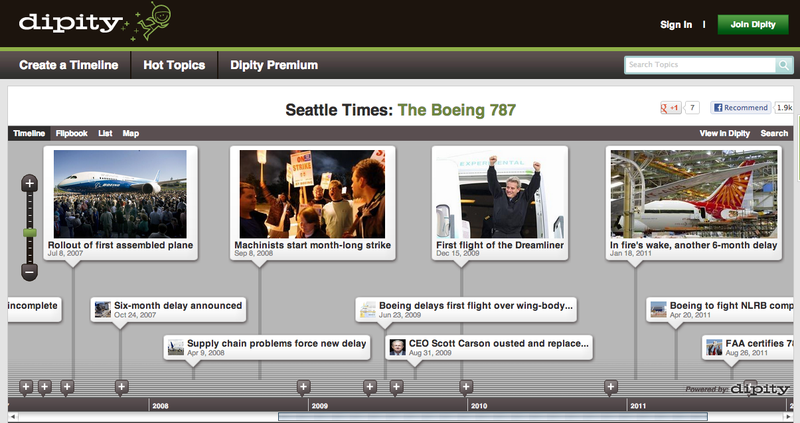 Timelines built using XTimeline can include text, images, and video.XTimeline will accept dates in A.D./B.C. format. Update 1/20/2014: XTimeline appears to have gone offline. TimeGlider offers some nicer layout features compared to XTimeline, but is not quite as intuitive to use as XTimeline. The layout features that I like about TimeGlider is the ability to stagger or indent events below each other in a sequence. TimeGlider also makes it easy to display the relative importance of an event by increasing its size in comparison to other events on the timeline. Like XTimeline, TimeGlider accepts dates in A.D./B.C. format. Time Toast is easy to learn to use. To add events to a timeline simply click on the inconspicuous "add an event" button and a simple event box pops up in which you can enter enter text, place a link, or add a picture. Time Toast does not have the more advanced editing options that XTimeline and TimeGlider offer. What it offers instead is ease of use which makes it a suitable choice for students in elementary school or middle school.